The holiday party season is upon us this year and the theme is definitely geek. But wait – you’re not “in” on IM? Do terms like terabyte and USB leave you cold? It’s 100 years or so from now. A young girl pulls an ancient box out from under a bed. Its clear body is blemished with age. A cloud of dust stirs around her as she pulls it across the floor and sits down beside it. The girl glances quickly at the door. She’s being secret, doesn’t want to be discovered. The morning sun pours in through the window behind her as she carefully lifts the cracked lid off the box. Its fragility is almost unbelievable as it flexes slightly. She looks at the word on it: Rubbermaid. Plastic. She’s been told this is plastic. Inside she finds more plastic, only it’s different. I’m really pleased to be able to publicly announce a project that I’ve been working on with some partners for some time now. It’s called Texthorse, and it’s a text-messaging treasure hunt that will take place for 5 weeks throughout the entire city of Whitehorse. We’re launching on Tuesday, November 27. As many readers here know, for quite some time I’ve been interested in the potential creative and business opportunities that mobile telecommunications technologies offer. To me, mobile today feels like the web felt back in 1994: full of explosive potential. But I think mobile contains more promise than even the pure web does today. Honestly. You don’t own any software at all. Even though one day you may have walked into a store like Staples and bought a boxed copy of Microsoft Office or Adobe Photoshop, all you purchased was a disk. What’s on that disk does not belong to you. Instead, the real value of what you purchased is a mere limited-use agreement with a software publisher like Adobe or Microsoft. That’s it. The software still belongs to Adobe or Microsoft. And, if they tell you to stop using their software, you have to stop using it. It’s a funny world, eh? You buy a car, you own it. You buy a loaf of bread, you own it. You buy a house, you own it. You buy an $800 software product: you don’t own anything. There was no indication as to when they might actually get around to setting that up. As far as I’m concerned, that’s a significant oversight as so many aspects of the device depend on location services for full functionality so I’ll certainly be making a refund request. What’s more, he indicated the fact that the time zone setting for the Whitehorse towers likely won’t get corrected in the foreseeable future. That should cause some grief for some people stepping off the plane up here! As I’ve been running around Whitehorse doing errands today I’ve been constantly checking my iPhone’s location awareness. It’s been a mixed bag. The iPhone uses a service provided by Skyhook Wireless to provide location services. Skyhook evaluates a device’s location by cross-referencing a proprietary database of Wifi base station locations, cell tower information, and GPS data. It’s unlikely that there’s any Wifi base station data for Whitehorse in Skyhook’s database. And, judging by the fact that my iPhone, when it’s set to automatically set my time, still indicates that I’m in the Mountain Time zone, I don’t think Bell’s cell towers have been properly configured for Whitehorse yet. So my guess is that Bell has done something in the last few days to kick-start GPS services to devices in Whitehorse. So, for now, location services on iPhones in Whitehorse are totally dependent on GPS, it would seem. My mixed-bag of results then, is probably based on my device’s access to a good view of the southern sky, which I often didn’t have whilst downtown today. It seems that Bell’s new network is getting a bit better at locating my whereabouts. 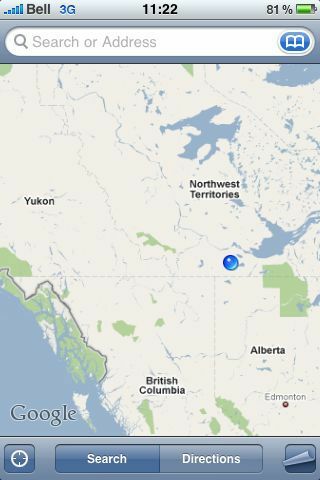 As you can see from this image, it now considers me to be somewhere in the southern NWT. Clearly some sort of GPS problem there. Getting there, Bell! if you sync with a network calendar, such as MobileMe, the iPhone will automatically set time zone support to the MT zone. One other risk, which I haven’t been able to verify to date, is that phone calls may be getting assessed as having being made from Edmonton. That could mean that local calls in Whitehorse may be billed as long distance. I’m trying to verify this with Bell. It’s easy enough to work around the network problems on an iPhone. Unfortunately, you’ll lose one of the device’s coolest and most useful features in the process: location services.